"Dr. McMahon has a great demeanor and is very personable." "The office staff has always been kind, very knowledgeable and caring." "Dr. McMahon and his staff far exceeded my expectations in the care I've received..."
The goal at Adult & Child Foot & Ankle Care is to deliver the highest quality podiatric care to patients ranging from young children to geriatric adults. The Adult & Child Foot & Ankle Care facilities were designed to be comfortable and welcoming so that all patients feel confident about getting the care that they need. Contact our offices or request your appointment online to arrange a consultation with Dr. McMahon. At Adult & Child Foot & Ankle Care, our priority is to deliver quality care and to prevent and treat all foot and ankle disorders in adults, children, and adolescents. 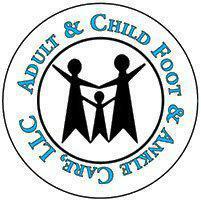 Welcome to Adult & Child Foot & Ankle Care! We proudly support Lucky Foot Store and Active Chiropractic | Click to learn more! At Adult & Child Foot & Ankle Care, we accept a variety of HMOs, PPOs, and other health plans. Here is a short-list of just some of the most popular plans we accept. Please contact our office to verify acceptance of your insurance carrier. "His evaluations and follow-up care continued to help me gain strength in my leg, ankle, and foot and confidence in my ability to get back to life." "Dr. McMahon and his staff are top notch. Great service, caring staff. They are a true asset to the Woodlake community." "Dr. McMahon really listens to his patients and understands not only foot problems but how different systems in the body work together. He's very smart."